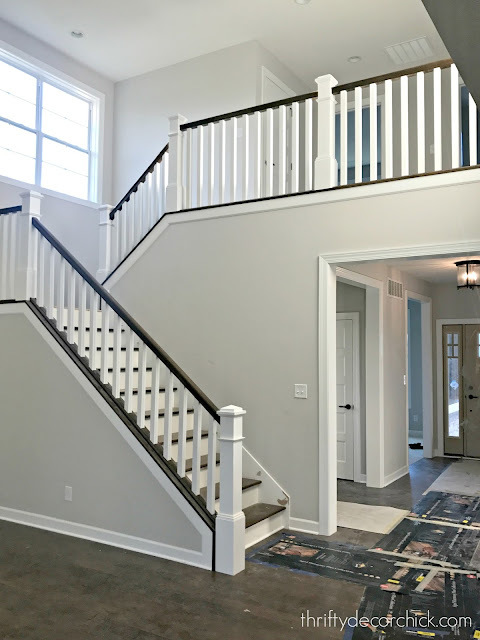 I loved that it was open to the great room and had a landing like our old stairs. I also prefer to have stairs in the back of the house instead of when you walk in the door -- it's just a personal preference for me. I think both are beautiful but I've always like that. One of the only big upgrades we did in the house were the wood steps and risers. If you remember, we were lucky to have pretty treads under our old stairs, so I ripped up the carpet and finished them myself. That began my love affair with wood steps! We did carpet down to the basement (again like before), but this staircase is such a focal point, I love my contrast. I thought about finishing them myself for a hot minute...and I'm SO glad I didn't decide to do that. Goodness. I would have been pulling my hair out doing that along with moving in and getting unpacked. No thank you!! They stained the steps to match our floors and I still need to ask about the stain color. I have a feeling it's a mix of colors but I'll be sure to update this when I find out. 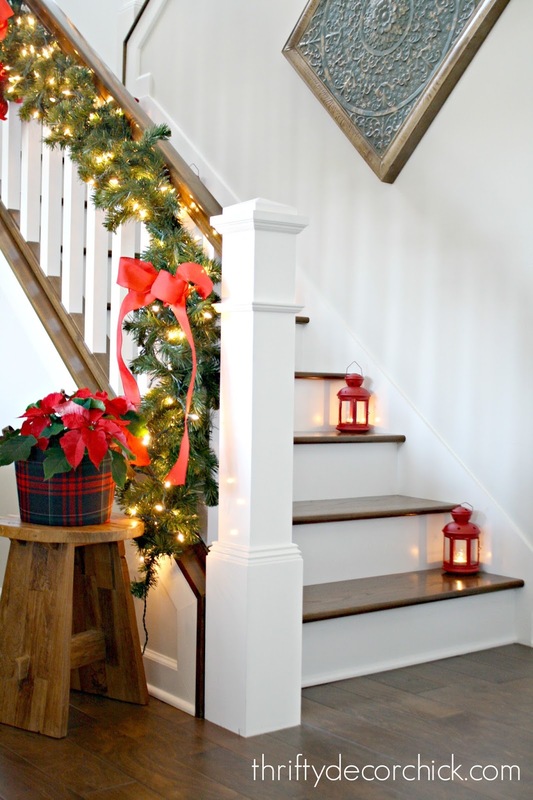 I could have gone with iron spindles but figured basic wood ones would stand the test of time. I think all of these choices are classic and will stand the test of time! I knew all along we'd have garlands all over them for the holidays. 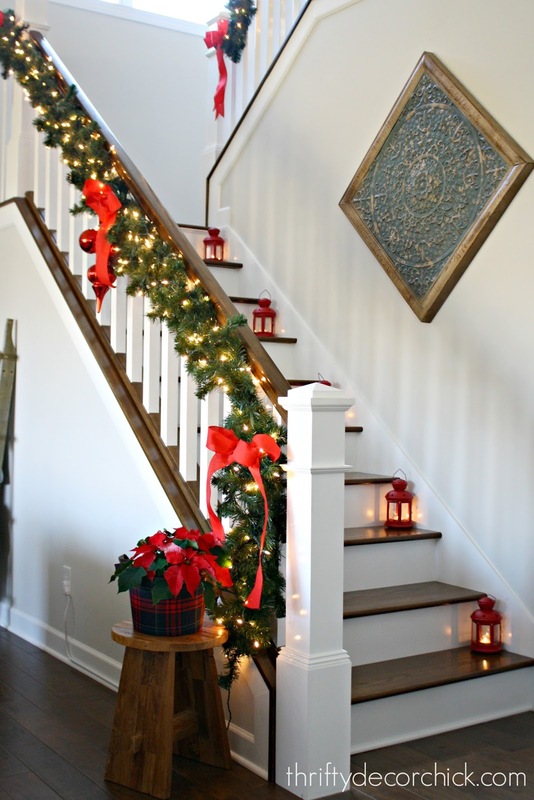 I used cup hooks underneath the railings to secure the garland from underneath. I've wrapped it around before and I get nervous about not being about to use the handrails. 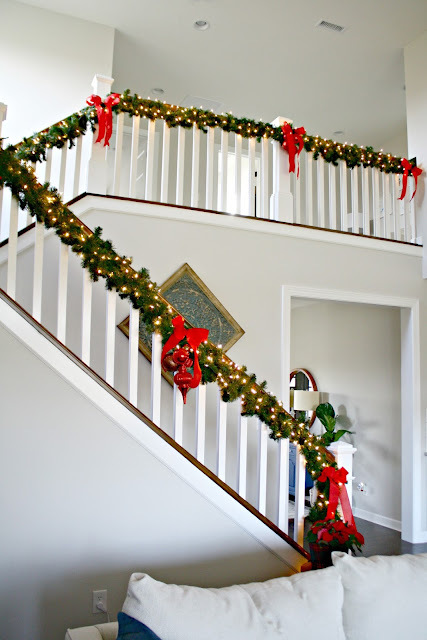 I also had the garland swagging a bit but preferred having it secured right up against the handrail. LOVE IT!! I was going to fill the other stairs with different lanterns, but again...I'm craving a simpler look in this house. Letting it breathe a little, even with Christmas decor everywhere! I just lay the lights throughout -- I don't even wrap those around. Makes them super easy to remove after the holidays. 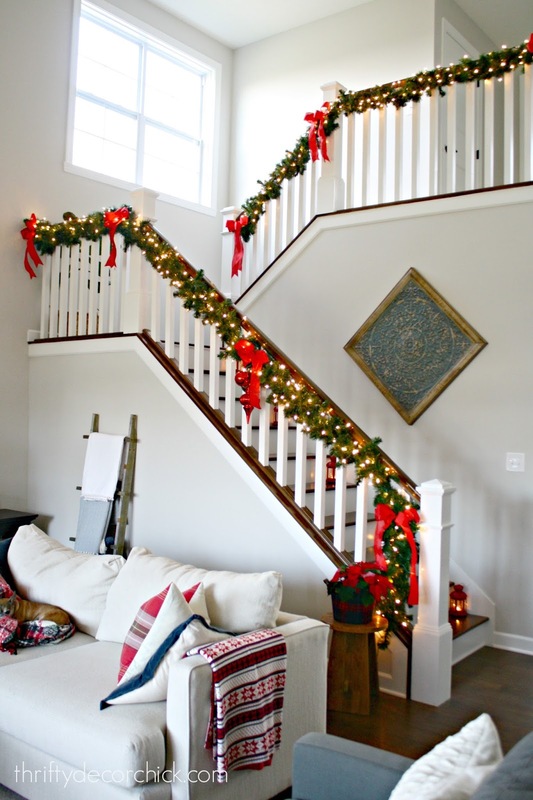 Do you dress up your stairs for the holidays? Do you go all out with greenery? 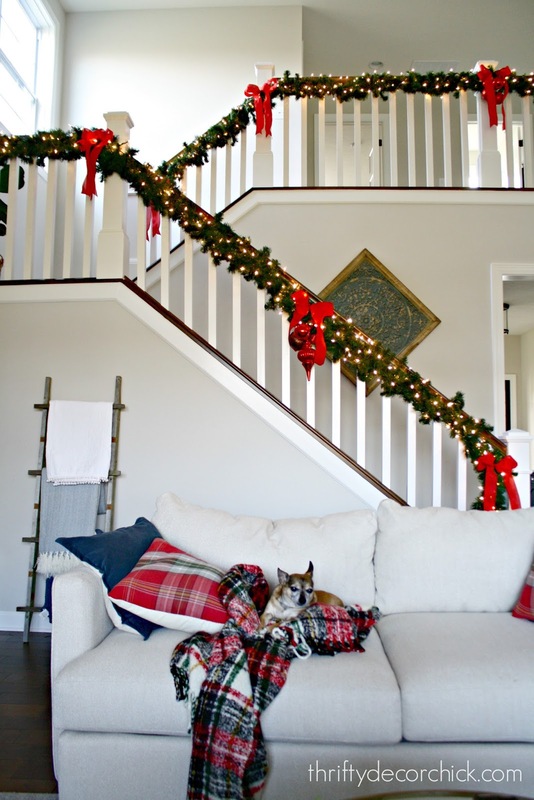 I've seen some stunning railings in blogland this year! Beautiful, now just add a big wreath with ribbon in the middle of the window on the stairwell! Love this! I get a kick out of your enthusiasm for your home. It has helped me be more appreciative of mine and for that, I thank you! 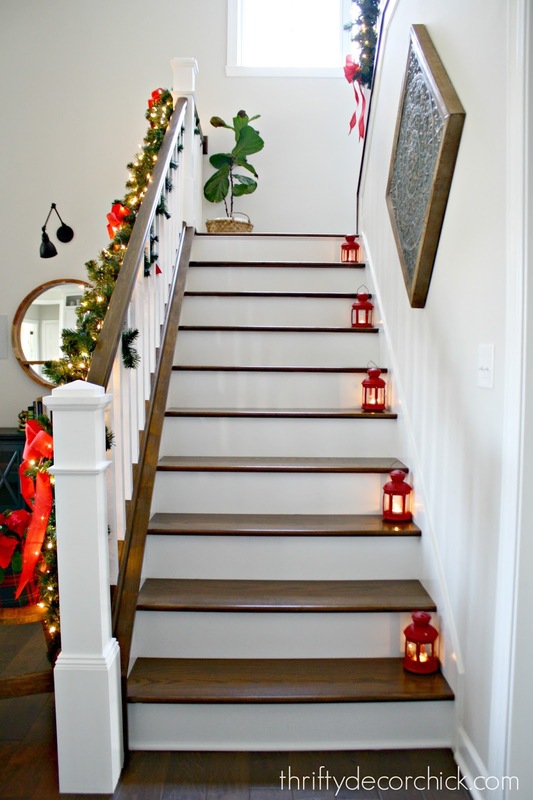 So beautiful and I love the little lanterns! Love how simply the decor this, but how effective it is! So festive! Not what you were meaning to show, but is that a compass on your wall stairs? Random “how to” question: do you just screw the cup hooks into the underside of your wood railings? And then unscrew and remove when you are taking down? Thanks! I wondered that also yesterday and am back today to see if anyone else was brave enough to ask! Looks gorgeous! I agree that a wreath on the windows would be great. Love that look! Thanks so much for the cup hook idea! Where did you get the beautiful piece of artwork on the wall? I normally do garland but I changed it up this year and used wreaths staggered. The wreaths were up in 5 minutes whereas the garland would take me awhile because you have to fluff and position. Love the new house and love your garland - I may break mine out and use it outside instead. Beautiful!! Your garland is so full and lush. Can I ask where you got itt? So lovely!! Yes, one can NEVER have too many outlets. I have them in most closets. You just have to post your floor plan for both stories some time! We've thinking of building and I love what I've seen of your house so far! 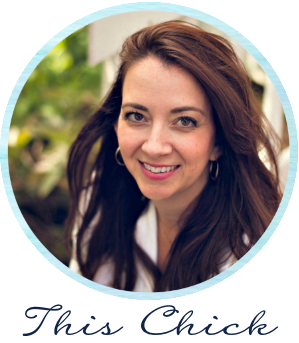 Is your master bedroom right inside the front door? 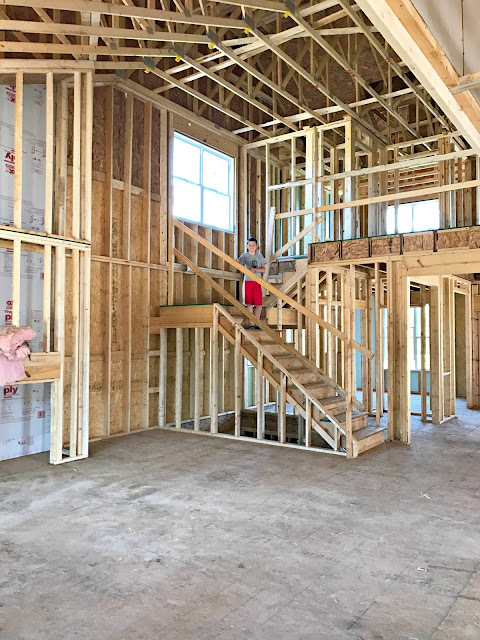 we're looking for a master down floorplan. Gorgeous!!!!!!!!!!!! I am loving watching you settle into your beautiful new home!! SOOOO pretty, Sarah! Really! Love the classic look. :-) Thanks for the outlet tips! Looks really great, Sarah. 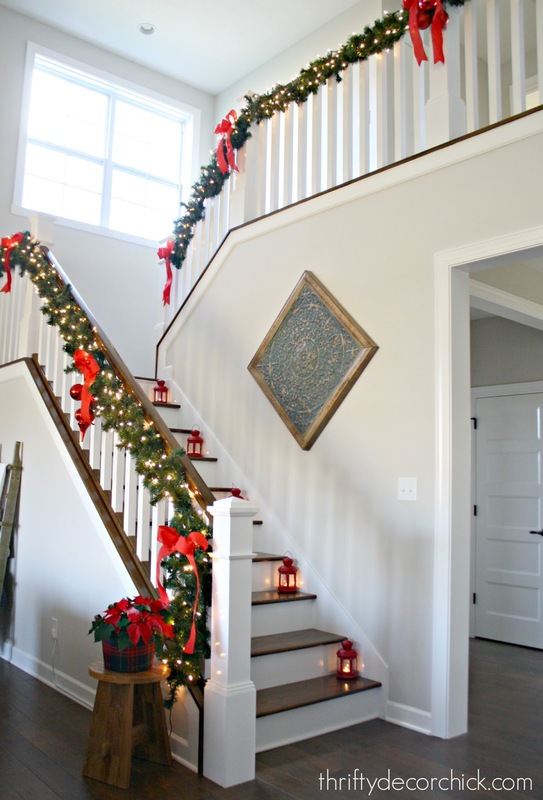 How fun to be in your new house for the holidays! Love you! Gorgeous. I am completely not in a holiday mood this year, especially with decorating. We have had our finished basement jackhammered and our front yard torn up ( had to dig 8 ft by 10 ft to reach and repair sewer and water line). Mistakes that former owners made that we are paying for... On the bright side my laundry room is no longer in the freezing cold and we no longer have sewer back up! !